One of the greatest handicaps to heart sur­gery is the fact that a constant supply of oxy­gen is needed throughout the body, especially to certain vital organs. The cardiovascular sys­tem is the only means of supplying the oxygen to the tissues. When the heart is stopped there is no other normal means for pumping the blood to the tissues. The length of time that a tissue may live without oxygen varies from organ to organ. The organ most dependent on a constant supply is the brain, which can with­stand a lack of oxygenated blood for no longer than 3 minutes. If the brain were deprived of its oxygen for a longer period, death would ensue or idiocy would follow. Needless to say, this limits the procedures which may be done on the heart. In recent years certain methods and devices have been developed to overcome this handicap to heart surgery. Hypothermia is a method of lowering the body’s temperature several degrees for prolong­ing the period in which the body can tolerate a discontinuity of circulation during a heart surgery. It has been found that when the body’s temperature is lowered below the normal 98.6°, the brain can with­stand a lack of oxygen supply much longer than the usual 3 minutes. With this method the body temperature is lowered to 80°F. or lower, and heart operations may progress for as long as 12 to 20 minutes. A refrigeration blanket is one method used to cool the entire body to this subnormal temperature. Through the coils in the blanket a refrigerant is pumped. The body temperature falls, and when this becomes uncomfortable, the anesthetic is begun. Other immersion techniques are also used. The pump oxygenator is essentially an arti­ficial cardiorespiratory (hcart-lung) system. With this procedure the blood stream is diverted from the heart and lung circulation and the heart actually stopped. The blood passes through the pumping machine, wherein it is kept oxy­genated. A system of tubings takes the venous blood from the right auricle, and it is pumped through the apparatus, is replenished with oxy­gen, and then forced back into the body through a tubing inserted in an artery. This method is also referred to as extracorporeal (outside- body) circulation. It allows the heart to be stopped for as long as 30 to 60 minutes. In such time the heart may be opened and operation within the chambers performed under direct vision. After operation the heart is stimulated and resumes its usual rhythmic pumping action, and the heart-Iung by-pass is disconnected. Combinations of these methods of heart sur­gery are also employed. Cardiotomy is the general term meaning any operation on the heart. Until more recently it was not feasible to stop the heart, or open it for operation within the chambers under direct vision. Until the advent of the specialized equip­ment which would allow this, the operation closed cardiotomy was useful in correcting a few types of valve lesions. In this procedure a small opening is made into a chamber of the beating heart just large enough to allow the surgeon to insert a finger into the heart. An instrument placed over the fingertip allows him to cut a diseased and scarred valve so that its opening is adequate and the valve leaves move more freely. Similarly, closed cardiotomy may be accomplished by the insertion of specially designed instruments through a hole made into the heart. Flow of blood around the finger or instrument is prevented by a suture around the opening to draw it tight. 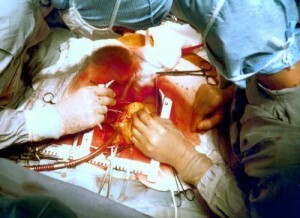 Open cardiotomy, as mentioned above, has more recently been made possible. In this the heart is stopped and an incision made into it for correction of de­fects under direct vision. To be sure, many more types of heart conditions are correctable by this method. Needless to say, many drugs are used in con­junction with these operative techniques. Basal Metabolic Rates – B.M.R.